Traditionally, the martial arts community believed that engaging in weight training was detrimental to the performance of the art, that it would hinder ones flexibility, speed, and agility. To be effective fighters, martial artists had to be quick and light on their feet like Bruce Lee and other slim and small, but powerful fighters. They maintained that karate was all about good techniques and proper timing and that muscle size has little to do with it. After all, the art of self-defense lies in the premise that smaller, weaker people can defend themselves effectively against larger, stronger opponents. While its true that good technique and proper timing are essential, theres no reason to believe that muscular fitness will hinder a martial artists effectiveness. In fact, just the opposite is true: with increased strength comes the enhanced ability to defend oneself. A well-designed weight-training routine--in addition to regular martial arts practice--will make practitioners stronger, not slower. In some cases, it can even improve their speed. Fortunately, the attitude toward weight training in the martial arts community has changed--largely due to an abundance of scientific data showing the positive effects of weight training for all kinds of sports. Todays athletes have much to gain by using weights to improve their performance. For martial artists, these gains include increased strength, increased resistance to fatigue, and even decreased risk of injury. 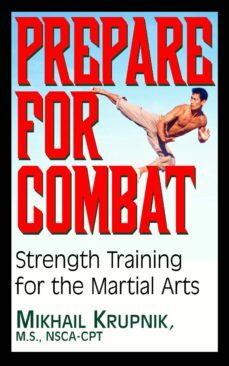 In this book, veteran martial artist and fitness expert Mikhail Krupnik shows readers how to design a weight-training program to fit their individual needs and goals. From all-important safety issues, determining ones levelof fitness, and setting goals, to specific exercises, sample routines, and even proper nutrition--he covers everything martial artists need to know to enhance their performance with weight training.